Perhaps the most obscure and “lost” 90’s group to have a #1 hit was Divine, which hit the top of the charts in 1998 with “Lately.” Dave O recently SKYPED with both Kia and Nikki from the group, who explained in detail why the trail went so cold on Divine so quickly. 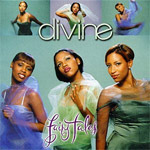 By listening to this interview, you will hear one of the more unfair situations of the entire decade, as the ladies had no idea they were being sued by another group already called “Divine” and that they wouldn’t make hardly a penny off of the project. The good news? Well, you’ll just have to listen to find out!